Asking toddlers to use a different potty, in an unfamiliar setting, is a whole new level of potty training, so don’t expect it immediately. Here are some tips for those unavoidable trips. Be Flexible. 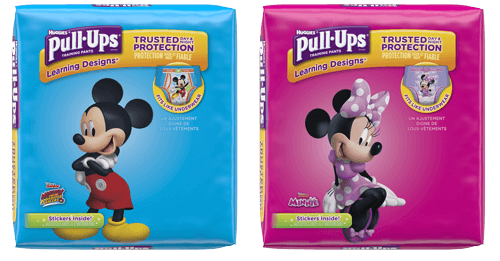 If your potty trainee has been using underpants, and you want to instead use Pull-Ups® while traveling, it’s fine to do that. Pull-Ups can really come in handy during lengthy car rides, plane trips or any other situation that calls for a little extra security and convenience than undies can provide. Your Puppy will do best with an explanation of how the trip will go. Involve him in the process of prepping for airplane or roadside bathroom stops. Your Owl will appreciate knowing ALL the details of the potties along the way and want to help pack and plan. Your little Turtle will be cautious about all the newness and will notice all the differences in the environment. Bring up the differences you expect to see along the way, like how the potties might look at a hotel, and ask how she'd like to handle it. Your Bear Cub and Squirrel will be so fascinated by the newness of the trip, potty training will be last on their list of interests. Dress your travelin’ toddler in easily removed clothing. Schedule frequent breaks for potty visits and checks on the Pull-Ups. If your kid has been in underpants, it’s okay to resume using Pull-Ups for a trip. Pull-Ups, as a backup, will lower stress on long airplane rides. In airplane bathrooms have your child use the toilet, wash their hands, and then stand outside the door while you press “flush.” The roar from the airplane toilet might be scary. Consider investing in a little toddler travel potty to keep in the trunk of the car and a car seat cover to protect your car seat. For shorter trips, have everyone use the potty before leaving home and upon arrival at your destination. In between, may the potty force be with you. The Time to Potty app can help remind you when it’s time to try. This helps busy parents remember to take potty stops even while on the go. Learn more about what to pack by reading our Potty Training Travel Checklist.